Dec 19th, 2018 Top notch service from Valor Janitorial! They’ve cleaned our companies office for a couple years now and always make sure to do a great job. Their staff is friendly and helpful, and very quick to respond in urgent situations. Highly recommend this team for your janitorial needs! Dec 19th, 2018 Workers are always helpful and on time. Dec 19th, 2018 Very professional and prompt. Great job. Dec 19th, 2018 Great Company with quality service!!!!! Dec 19th, 2018 Best service ever. Dec 19th, 2018 Awesome work deep cleaning our building! Dec 19th, 2018 Great response time to my initial inquiry. They took the time to make sure that all of my cleaning wants/needs were completely satisfied. Jul 28th, 2018 Awesome work performed. Will most definitely use again. Jul 19th, 2018 awesome company. Mar 9th, 2015 We have used Valor to clean our offices for approx. 5 years. We are very happy with your service and appreciate the care that your employees take with our environment. Mar 9th, 2015 I still notice some dust that is missed with vacuuming, but everything else is great! Sep 20th, 2014 I used Valor Janitorial on a cleaning job for a popular bar renovation show while in the Arlington, TX area. They were absolutely wonderful and cleaned a FILTHY kitchen up to be fully functioning in a few short hours. They were punctual and professional. I would recommend them not only for janitorial use but restaurant and production use! They were awesome! Aug 18th, 2014 Everyone including the store was pleased with the response time and the work completed. We will definitely use you again. Aug 6th, 2014 The deep office cleaning from Valor was excellent. They were nice professional,thorough and knowledgeable. I would definitely recommend Valor! Jan 28th, 2014 Valor always exceeds my expectations! Jan 22nd, 2014 Valor helped out my crew on a popular bar renovation show with the cleaning of a very neglected kitchen. They were fantastic and did a GREAT job - I would highly recommend them!!! Nov 22nd, 2013 Brandon is very attentive to our needs from the first call. He delivered his quote on time and he took extra steps in getting our facilities to look uniform. In the beginging we had some misunderstanding between the cleaning crew and our company but Brandon was quick to have someone out to make it right. So far we are very pleased with our services and we would recommend them to another company. 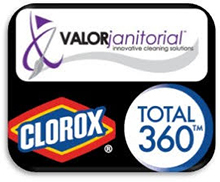 Nov 22nd, 2013 Valor is simply the best janitorial service I have used! Very seldom do we have issues, but if we do, one phone call takes care of it. Brandon and his staff are the best! Period!! Nov 21st, 2013 Valor did a great job and were very easy to work with. I had to reschedule for another evening and they did a great job in working with me to reset the appointment to the next evening. Nov 20th, 2013 Continued good service is greatly appreciated by everyone@ Colmet. Thanks again for everything. Nov 20th, 2013 Valor has ALWAYS been professional and proficient. We have always been above satisfied with their services! Nov 20th, 2013 We had some hiccups initially in the cleaning process with filling of dispensers, but otherwise the level of cleaning is top notch and all calls and questions are responded to promptly. We are satisfied with the service we are receiving. Nov 20th, 2013 Wonderful people and great service!!! Wish I could have you all clean ALL our properties. Nov 20th, 2013 Valor is easy to do business with and when an issue comes up you are very willing to fix it. Nov 20th, 2013 Always does a great job. Any corrections in our service has always been taken care of promtly. Nov 20th, 2013 The carpet looks brand new, thank you. Sep 29th, 2012 We have been using Valor Janitorial for 7 years now and the service has been second to none. Before using Valor we went through quite a few services. The quality of service was just never quite right but more importantly the lack of communication was frustrating to say the least. Brandon and staff at Valor are always easy to get a hold of and would actually seek me out if they haven't heard from us to make sure that everything is alright. If you're looking for quality service and good communication with a leading edge company I would highly recommend using Valor Janitorial Services. Sep 25th, 2012 We have been using Valor for a couple of years now and could not be happier with our service. The owner takes a very hands on and personal approach to running his business. We have 3 retail cigar lounges, which can get very dirty. The crew at Valor has the store shining after every cleaning. I would definately reccomend them. Sep 25th, 2012 Great company! I worked there for a couple of year in 09 and 10. 4.97 out of 5 stars based on 37 customer reviews.